Spooner has been in more than 200 parades in his lifetime. Spooner, a 16-year-old paint cross, attended his first parade in Dorchester, New Hampshire, when he was 5 years old. Since then, he’s been to July 4 parades and homecoming parades both locally and as far away as Milwaukee, Wisconsin, with his rider, Lynn Braley. They’ve dressed up as the American flag. In some parades, she’s worn elegant dresses and he’s worn wreaths around his neck and legs, and ribbons in his mane. “We’ve done a lot together as a team – he’s very safe and dependable,” said Braley. 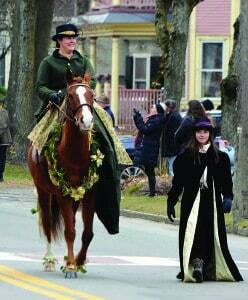 The annual Wassail Parade in Woodstock is one of their favorites. Braley hasn’t missed a Wassail Parade in 19 years. She comes every year, no matter the weather, from her home in Canaan, New Hampshire. This weekend marks the 34th anniversary of the Wassail Parade. 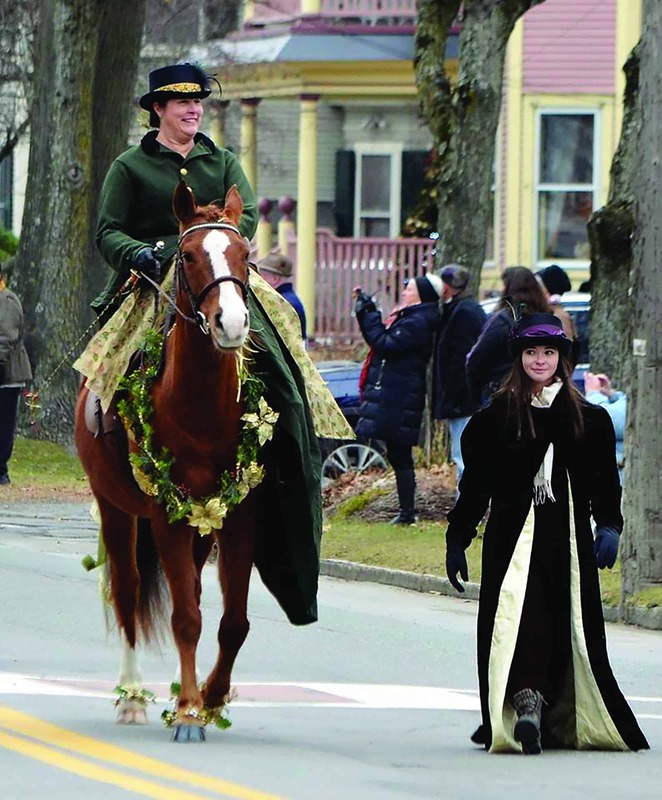 About 30 parade riders, clad in 19th century Currier and Ives-themed costumes, and their horses will stroll the Green of Woodstock as about 5,000 people line up to watch at 2 p.m. on Saturday, Dec. 8. “It’s growing. The word has spread throughout New England and beyond,” said Woodstock Chamber of Commerce Assistant Director Kathy Avellino. This year will be different for Braley. She was asked to lead the parade for the first time. Braley was asked to be the grand marshal by parade organizer Nicole Jorgensen, who leads the High Horses Therapeutic Riding in Sharon. Braley rides in a 100-year-old side saddle she bought on the internet. Her outfits—long capes and dresses—are often handmade. “I like to give the people something different,” Braley said. Braley has been preparing her costume for the Wassail Parade for a year with the help of a friend. It features a bold red cape and jacket. Braley said people who attend the parade every year expect to see her and Spooner. “She really puts her heart and soul into it,” said Braley’s friend, Greg Greene of Pomfret, who often goes to watch. Spooner and Braley have a special connection. This will be Spooner’s 10th year in the Wassail Parade in Woodstock. Before Spooner, Braley rode Spooner’s mother, Lady, in the Wassail Parade. Braley bred Spooner and raised him to be a trail and parade star. Braley started bomb proofing Spooner the first week he was born. Braley took him through a series of obstacles around her home she calls “Lynn’s crazy things.” Braley walked Spooner over tarps and metal. She exposed him to balloons and loud noises, like gunshots and sirens —anything he would likely encounter in a parade. Braley even took him near brush piles so the bonfire in the middle of the Wassail Parade would seem less scary. Spooner looks forward to parades, said Braley. The only part he doesn’t like is getting his white legs cleaned. “I like them to be white,” Braley said. Woodstock’s Wassail Weekend begins Friday, Dec. 7 and continues to Sunday, Dec. 9. It features a Yule Log lighting, Messiah sing, movies, live music and breakfast with Santa. For a full schedule of events, see page 20 or visit woodstockvt.com.